The City of Ventura, California is located between Malibu and Santa Barbara and is one of the most livable communities in America. 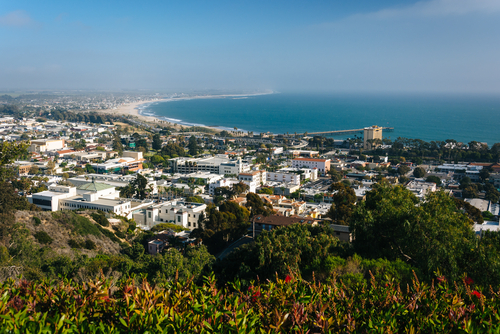 Ventura is part of the Los Angeles Metropolitan Area and home to over 106,000 residents. Ventura was originally founded as San Buenaventura (still the official name) in 1782 and incorporated as a city in 1866. Due to growth in oil fields and auto travel in the 1920s, there was a major real estate boom. After WWII, suburbs began replacing farmlands and Ventura continued to mature as a seaside community. Ventura is ripe with shopping and dining opportunities. The downtown area near the beachfront promenade features a wide range of shops down Main Street. Clothing shops like Heavenly Couture and Buffalo Exchange offer fashion alternatives, or find something formal at California & Main. Betty Belts turns leftover seaboard resin into beautiful jewelry. For unique gift items there’s shops like The Refill Shoppe and Sea Things. Ventura Harbor Village is another collection of stores that’s perfect for ocean lovers with shops such as Ventura County Potters’ Guild and Harbor Wind & Kite Co. Antique collectors will delight in the selection of antique dealers in Ventura as well. The Pacific View Mall is another great mall that offers more mainstream shopping options such as Macy’s, H&M, and PacSun. Dining in Ventura is a non-stop parade of culinary delights. Great seafood is a must in a coastal community like Ventura, and Lure Fish House brings the best fresh seafood to the table. And if you’re ready for an outstanding breakfast, then Pete's Breakfast House Restaurant is where you need to go. Another great breakfast spot is Cafe Nouveau, where you can enjoy your morning eating outside on their relaxing patio. Other outstanding restaurants in Ventura include Aloha Steakhouse, Cafe Fiore Restaurant, Social Tap, and Anacapa Brewing Company among many others. There is an estimated 109,708 residents living in Ventura as of 2015, with around 43,000 housing units. The median family income is around $60,000. There are a number of large employers in Ventura, including the County of Ventura, Ventura County Health Care Agency, Ventura Unified School District, Ventura College, and Community Memorial Hospital. Ventura has a large range of parks and places of interest. Downtown Ventura features the restored Mission San Buenaventura, along with a number of museums including the Albinger Archeological Museum and the A J Comstock Fire Museum . Plaza Park is home to the largest Moreton Bay Fig Trees in the country. 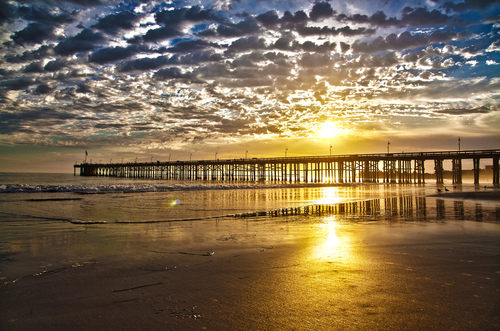 Ventura is also rich in arts and culture, and notably the Ventura Film Festival. There are over 35 parks in Ventura. Parks include County Square Linear Park, Belaire Linear Park, Hobart Park, Junipero Serra Park, Arroyo Verde Park, Marina Park, Northbank Linear Park, Rancho Ventura Linear Park, Brock Linear Park, San Buenaventura State Beach, Kennebec Linear Park, Ventura Community Park, and Woodside Linear Park. The Ventura Unified School District oversees the educational need of the students in Ventura. The district manages over 25 schools and other programs. Elementary schools include Pierpont, Citrus Glen, Montalvo, Juanamaria, Blanche Reynolds, Sheridan Way and Will Rogers, among others. Middle schools consist of Anacapa Middle, Balboa Middle, Cabrillo Middle, and DeAnza (DATA) Middle Schools. Ventura High, Buena High, Foothill Technology HS, El Camino High, and Pacific High make up the high schools. The healthcare needs of residents of Ventura are served by several major medical facilities – Community Memorial Health System, Community Memorial Hospital, Ventura County Medical Center, and Ventura Urgent Care Center.